To soften the blow to children, and to rid themselves of unwanted pets, Mom and Dad tell kids lies like, "Your goldfish just went to live on a farm in Colorado." Except in this case, it really happened -- and then the fish got revenge in a Hitchcock-ian way and overtook the lake. Thousands of aquarium fish have recently been found swimming around a lake in Boulder’s Teller Park, and it's a big problem. Park officials believe someone illegally dumped goldfish in the lake a few years ago, and since then, they've reproduced like rabbits. Or like free-range goldfish. Either way, the lake's now teeming with ring-toss prizes. 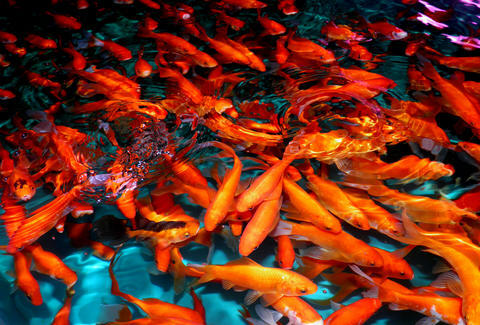 And though the goldfish may seem cute, they're actually destructive; the exotic, store-bought fish can be harmful to the other fish and upset the lake's entire ecosystem. "Most people don't realize the far-reaching effects of introducing exotic species to the environment," Ken Kehmeier, Colorado Parks and Wildlife’s senior aquatic biologist, said in a press release. "Non-native species can be devastating to native populations by causing disease outbreaks and creating competition unbalance. It's an issue that anyone concerned with our environment should know about." Wildlife officials may have to drain the lake altogether to organically restart the native fish stock, or use a custom-designed boat to extract the intruding goldfish by electroshocking them. “It stuns the fish. It doesn't kill them," Colorado Parks and Wildlife spokesperson Jennifer Churchill explained to KSDK. "They get stunned and they float to the surface and we can collect them." They'll then likely end up as feed in a rehab center. FYI, Ms. Churchill: this scene is still frightening. Park officials are urging the public to refrain from dumping pet fish in their water for the sake of the environment. Seriously, stop being fishy, people.